Download The Wonder of Birds ebook. The Wonder of Birds: What They Tell Us About Ourselves, the World, and a Better Future. Our relationship to birds is different from our relationship to any other wild creatures. They are found virtually everywhere and we love to watch them, listen to them, keep them as pets, wear their feathers, even converse with them. Birds, Jim Robbins posits, are our most vital connection to nature. They compel us to look to the skies, both literally and metaphorically; draw us out into nature to seek their beauty; and let us experience vicariously what it is like to be weightless. Birds have helped us in so many of our human endeavors: learning to fly, providing clothing and food, and helping us better understand the human brain and body. And they even have much to teach us about being human in the natural world. This book illuminates qualities unique to birds that demonstrate just how invaluable they are to humankind—both ecologically and spiritually. The wings of turkey buzzards influenced the Wright brothers’ flight design; the chickadee’s song is considered by scientists to be the most sophisticated language in the animal world and a “window into the evolution of our own language and our society”; and the quietly powerful presence of eagles in the disadvantaged neighborhood of Anacostia, in Washington, D.C., proved to be an effective method for rehabilitating the troubled young people placed in charge of their care. Exploring both cutting-edge scientific research and our oldest cultural beliefs, Robbins moves these astonishing creatures from the background of our lives to the foreground, from the quotidian to the miraculous, showing us that we must fight to save imperiled bird populations and the places they live, for the sake of both the planet and humankind. 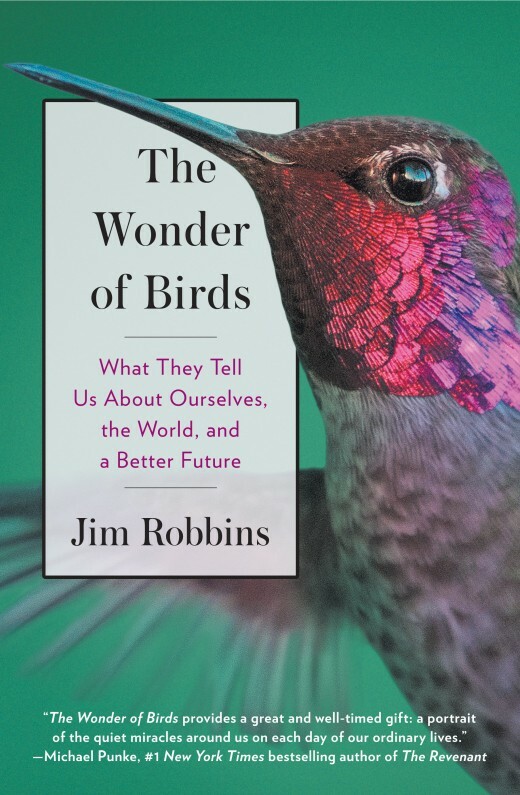 “Using enchanting stories and rich historical references, Jim Robbins explores the role of birds on the evolution of human self-awareness.”—Robert F. Kennedy, Jr.
Jim Robbins has written for The New York Times for more than thirty-five years. He has also written for numerous magazines, including Audubon, Condé Nast Traveler, Smithsonian, Scientific American, Vanity Fair, The Sunday Times, and Conservation. He has covered environmental and science stories across the United States and around the globe. Robbins is the author of The Man Who Planted Trees: A Story of Lost Groves, the Science of Trees, and a Plan to Save the Planet; Last Refuge: The Environmental Showdown in the American West; and A Symphony in the Brain: The Evolution of the New Brain Wave Biofeedback. He is also the co-author of The Open-Focus Brain and Dissolving Pain. He lives in Helena, Montana.